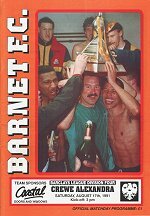 Barnet made an amazing start to their debut season as a Football league club. In their first League match they lost 4-7 at home to Crewe, in their next match they drew 5-5 at home to Brentford in the League Cup and within a couple of weeks they had won 6-0 at Lincoln in the League. Results. In the FA Cup Rochdale came up against the first Scottish side to reach the competition proper in over a century. They beat Gretna - then in England's Northern League - in a First Round replay. The FA Cup saw a change in the rules from the First Round onwards with a penalty shoot out replacing second replays. The first such shoot-out took place a Millmoor, Rotherham on Tuesday November 26th 1991 when Rotherham United defeated Scunthorpe United 7-6 on penalties after finishing extra time 3-3 in a First Round replay. In March 1992 Aldershot were declared bankrupt and as a result had to resign from the League. They had played 36 matches but those results were declared void. For details of the matches Aldershot played, click on Aldershot. Vauxhall Conference champions Colchester United replaced Aldershot for the start of the 1992/93 season (1991/92 Vauxhall Conference table) and so saved Carlisle from relegation.